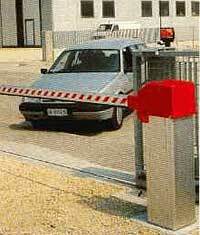 Securitex Electronic Systems Engineering/ Liberalli barrier system. The extremely reliable mechanics have found their perfect position inside a structure, which has been exhaustively studied in order to guarantee a one hundred percent resistance to atmospheric agents. * The cabinet housing made up of modular components in anodized aluminum has a lockable access door to the manual maneuvering with security relay. * The incorporated electronic programmer is factory set for the connection of all accessories. * The central bar-attachment housing gives the barrier a perfect symmetry and the possibility to positioned either to the left or to the right of the passageway. * Regular and silent in movement: This feature is guaranteed by the internal spring balanced movement control. 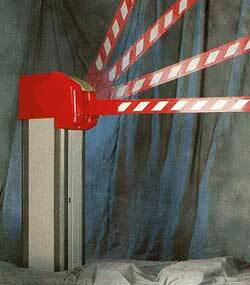 * The barrier is locked when in its closed position due to the irreversible movement control. 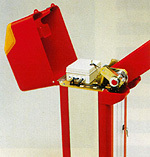 The barrier can be easily be maneuvered manually (in the case of power failure) from within the lockable cabinet. The bar made out of aluminum with reflective red and white stripes is completed by adding a rubber contact safety tube to lower edge. * The installation (for all models) is easy and quickly carried out. No fixed structure is required as the base of the cabinet is anchored to the ground. The modular structure allows easy maintenance after the installation in order to facilitate the replacement of bodywork parts accidentally damaged during its service life. * The unit does not require periodic servicing. EL ALUMINUM is suitable for used on passageway, including: parking lots, private roads, factory and motorway entrance. EL 312 Rapid barriers: For passageways of not more than 3 meters. EL 412 Rapid barriers: For passageways of not more than 4 meters. EL 612 Standard barriers: For passageways of not more than 6 meters. EL series barrier system structure. LIBERALI barrier EL series are the best barrier ever being manufactured and is the most robust barrier we ever come across. Its system reliability makes it one of the most suitable barrier for the most extreme car parking condition.